EXOSPHERE (AUS) (Bay 2012-Stud Aust. 2016, France 2017). 5 wins-2 at 2-from 1000m to 1400m, A$1,091,600, ATC Golden Rose S., Gr.1, Roman Consul S., Gr.2, Skyline S., Gr.2, Run to the Rose H., Gr.2, 4th VRC Coolmore Stud S., Gr.1, Lightning S., Gr.1. Grandson of SP Highest, a half-sister to SW Tell Me Straight (WATC Belgravia S., L) and SW Vibrant Virgo. Closely related to SW Destino, SW Genuine Girl, SW Impressing Matters, etc. His oldest progeny are yearlings. Red Hot Spice (g. by More Than Ready). Placed in Aust. Mr Wong. Winner at 1450m in 2018-19 in Aust. Shiitake. Winner at 1100m in 2018-19 in Aust. ZAGREB (Zabeel). 4 wins from 1200m to 2000m, A$427,685, SAJC Chairman's S., L, MRC Naturalism S., L, SAJC Birthday Cup, L, Skycity P., 2d South Australian Derby, Gr.1, MRC Heatherlie H., L, 3d VRC Australian Cup, Gr.1, 4th Kilmore Cup, L.
Snake Charmer (Pentire). 4 wins to 1500m, A$144,095, SAJC Schweppes H., Mac Drink Driving Grow Up H., Dowie Doole Wines H., 2d ATC South Pacific Classic, L, SAJC A Sheppard Constructions H., 3d ATC TAB Rewards H., SAJC Australian International Three Day Event H.
A Man to Match (High Chaparral). 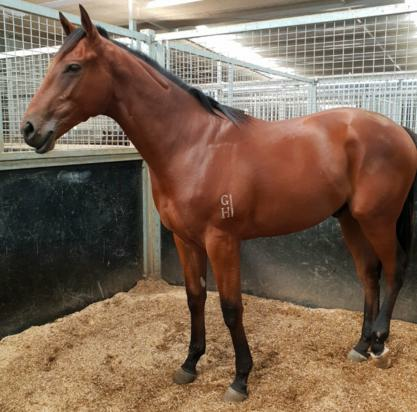 2 wins-1 at 2-at 1300m, 2000m, A$124,000, to 2018-19, BRC Makers Mark Eagle Way H., 2d BRC Cascade H., 3d SCTC The Phoenix S., L, BRC Meagher Racing Eagle Way H., Qld Tatt's RC Eagle Way Stayers H., SCTC SC Lightning Eagle Way Series H., Sporting Chance Foundation H.
ECLAIR MYSTIC (Stratum). 6 wins-4 at 2-to 1400m, A$279,875, MRC Zeditave S., L, VRC Red Tempo H., Community Raceday 2YO H., MRC Acorn 2YO H., Jack Elliot 2YO H., 3d MRC D'Urban S., Gr.2, VRC Standish H., Gr.3. DANSINO (Danehill). 4 wins. See above. NIBLICK (Encosta de Lago). 8 wins from 1300m to 2000m, A$452,925, VRC Sofitel H., L, Canberra RC National Sprint H., L, Albury Gold Cup, L, VRC Grazia Ultimate Style Guide H., Living Legends H., 2d WATC RJ Peters S., Gr.3, VRC Henry Bucks Best Dressed H., MRC Pavilion P., 3d MRC Eclipse S., Gr.3.